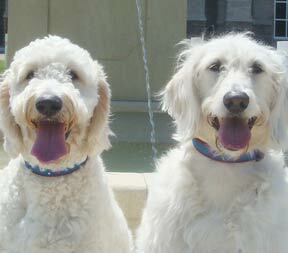 Dandy the Labradoodle and Biscuit the Goldendoodle are energetic, fun-loving companions. They enjoy swimming at the beach or lake, fetching a Frisbee, or just going for a walk around the block. Hug them and they'll hug you back. Send us a photo of your own fetching friend pictured with one of our products. If we use your mug on our site, we'll send you one of ours in return (it'll feature your breed). To send us your entry, just complete our contact form. May you bury the competition!